As Columbus boys, this week we are getting more jacked up about the Memorial Tournament next weekend than this high-class Kroger invitational. 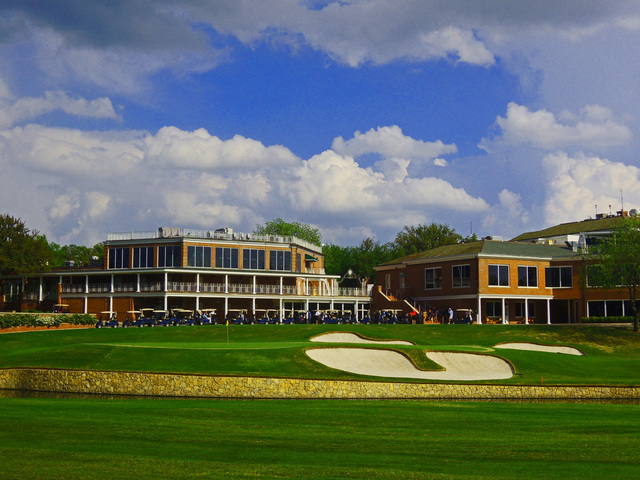 However, playing host to the formal Crowne Plaza Invitational, Colonial CC is in its eighth decade of hosting a PGA event so there is a rich tradition with this tournament, even if the name has changed. Accuracy is the name of the game, as we’re looking at driving accuracy, and proximity to the hole, rather than who can freak-bomb it off the tee. And what would a golf course be without a snazzy nickname for a 3-hole stretch of disaster. Augusta has Amen Corner, Quail Hollow has The Green Mile, and Colonial CC has The Horrible Horseshoe ending with hole-5 along the Trinity River. Without further ado let’s get to it. 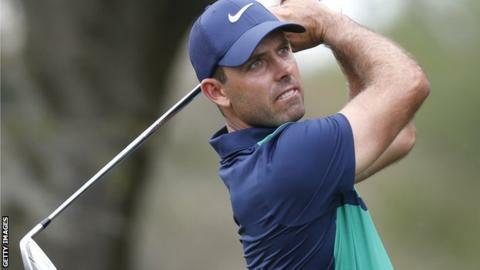 Jon: My pick of the week is going “The Baas,” Charl Schwartzel. CS has played 9 events missing the cut once, and notching 5 top-25’s, including a win. I love this play for a few reasons: The rust should be gone as last week he played his first tournament since The Masters. He is top-50 in our key stats, including 9 in strokes gained tee-to-green, and a nice 12 ranking in par-4 scoring average. He’s a birdie buster, who can get it done. The only thing that doesn’t bode well for Charl is his course history, which is not exactly stellar. At $9,000 though, you can fit Charl into just about any lineup. Jon: Kevin Chappell is my fade of the week. All I’ve been hearing is how this is Chappell’s tournament to win, and how everyone is all aboard the Chappell hype train. I get it, he’s a great player, and has been playing the best golf of his career. However, the $9,600 price tag and “Kevin Chappell” just don’t add up. His average price throughout the year is $7,800 and people are all aboard paying up for him. I just don’t see it. By all means, he could come out and win, but more likely I’m thinking high price for and a high ownership percentage for an average finish. Adam Scott – Course history and pretty much tops in every statistical category you could want, save for driving accuracy, but you know what? It doesn’t matter much because he is pretty dang good making GIR’s from the rough as well. A winner at this event also suggests he knows what he’s doing. Matt Kuchar – Okay, so the disappointment continues with Kuuuuuch, a crowd favorite who you really count on to win at least once every season. But the results are coming back for Kuchar. He is getting back in contention, with the obvious highlight of back to back T3 finishes started at the Players. With Kuchar in form, there is no reason to fade a guy who can be as consistent as the best. Zach Johnson – Your course-horse ladies and gentlemen. ZJ knows this course real well. He’s a multiple winner with multiple top 10’s and has never been cut here. If you want your cash game play, well you’re looking at him. Kevin Na – Course history is there, and statistically he should be highly favored. He’s got a nice par-4 scoring average. As long as he doesn’t get in his own head Na should be a safe play to contend. If he starts making mistakes though, then lookout. Colt Knost – Knoooost! Colt has been making cut after cut after cut. He currently ranks 9th in our model, and would look to be a nice cash game play. I like the T3 at The Players — another course that demands management — and it looks like that got his confidence going. Couple that with a top-10 finish at Colonial CC in 2015 and I would say Knost is trending in the right direction. 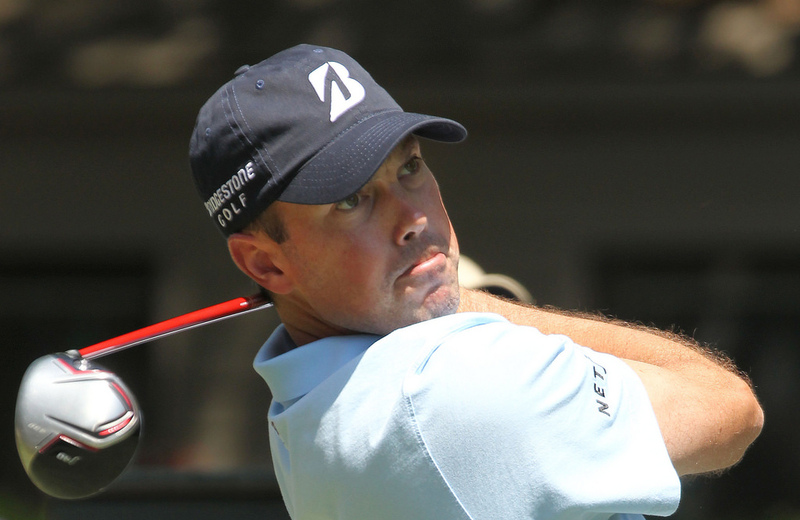 Ryan Palmer – Another guy with multiple top-10’s at a course where history matters. He’s quietly had himself a decent season, and putting him back in his home-state of Texas can only mean good things for the Aggie. Jimmy Walker – A mild contrarian play. Jimmy hasn’t been playing well as of late. But to drop him down to $8,500 is a real discount. This is a guy who was ranked in the top-10 of the World Golf Rankings in February. He has a recent top-10 at Colonial in 2014, and his stats are there. If he uses last week as a bounce back, I think Jimmy can contend here. Smylie Kaufman – The rook! Smylie should in theory be another nice contrarian play. The worry here is his accuracy off the tee. If he can control his driver, then you can just let the Draft Kings scorer do his thing, as he has admitted that his putter is one of the strongest parts of his game. I like Kaufman to be a sneaky GPP play. @SmylieKaufman10 What do you feel the strongest part of your game is? Daniel Summerhays – Though not a household name, DFG players and PGA Tour followers have come to know Summerhays as a guy who consistently appears on leaderboards. He has never won on tour and never broken through into consistent major and FedEx Cup event invitations, but when he gets on a streak he can be as consistent as anyone to make a cut. 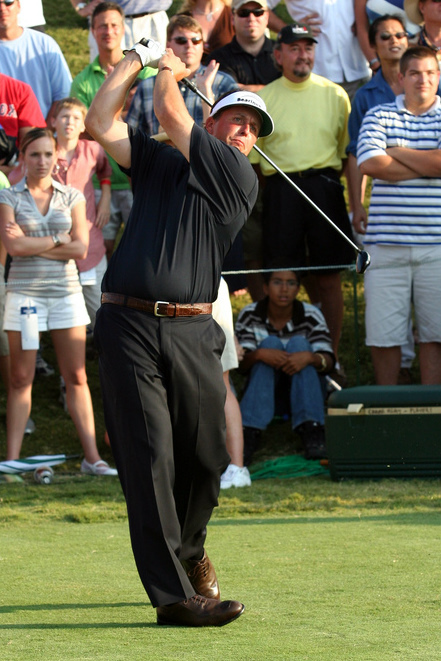 I see Summerhays as the “poor mans Colt Knost” this week. Not only is he much cheaper, I think he will be lesser owned than some other guys at the 7k price, such as William McGirt and Cameron Tringale. Sean O’Hair – O’Hair is like that friend you have who is typically really funny, but every once in awhile, they try too hard and you have to apologize for them. When O’Hair is on, he’s just on, and when he’s off, you can pretty much forget about him. I like him to have a good week, as he’s got a high par-4 scoring average, and can scramble to make his pars. Bogey avoidance should be the name of his game, and I think it works out this week. Adam Hadwin – My not-so-sneaky play of the week. I’ve had Hadwin in my lineups since the RBC, and maybe it’s because I haven’t felt him burn me with a cut, but I freaking love this Canadian. His ability to go low is what keeps him in my lineups; when his putter gets hot — and it will get hot — he starts raking in points. His stats don’t make your eyes light up, but the dude also has a nice top-5 finish here last year following 4 consecutive missed cuts. I’ll take him this year, where he is routinely shooting in the 60’s. David Hearn – FeelTheHearn! 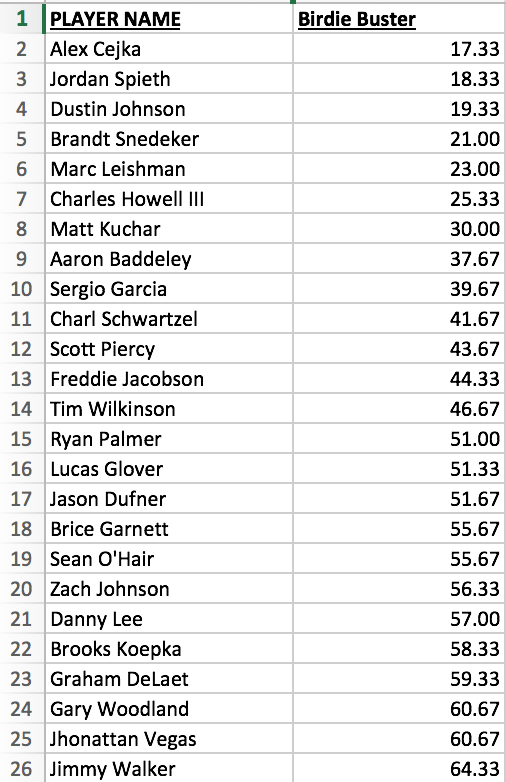 As stated above, accuracy is the name of the game, and Hearn is ranked deceptively high coming in ranked 26 in driving accuracy, and 29th in our total proximity model. It helps that he’s not to shabby in the strokes-gained categories either. I like Hearn as a nice GPP play. Talk about a hangover easy. Regardless of the what tournament follows up The Players, it’s not going to be the most heralded of the bunch. TPC Four Seasons favors those long hitters, and those who can get their putter hot. Both Tom and myself are suffering a busy work week, and being quite ill, respectively, so this will be pretty short and sweet. For starters, lets talk about weather. Irving, TX is supposed to get a lot of rain this weekend, especially Thursday. If there is one thing this affects, it’s the Thursday afternoon groups, and the Friday morning groups. Why? Because typically they end up playing back-to-back golf on Friday. I know they are elite athletes, but that type of excess play can put a strain on anyone, both mentally and physically. Matt Kuchar – Mr. cash game. Kuch has been consistently solid throughout 2016. I like him to make yet another cut this week, and to also contend. Charl Schwartzel – Projects 2nd in our unweighted model. Charl has been playing good golf as of late. There is a chance that he could be a bit rusty, not having played since The Masters, however that should be balanced out by the weather. Sergio Garcia – I think Sergio makes for a nice contrarian play. I would expect him to have low ownership this week, but he still will contend. Gary Woodland – Along with Kuch, a definite cash-game play. He rarely misses cuts, and on a bomber course like this, I would also look for him to push for a top-10. 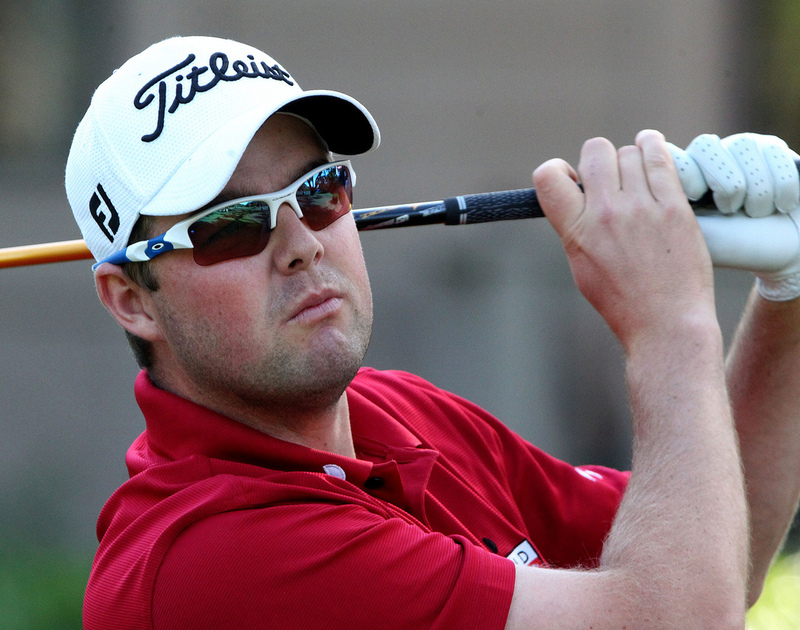 Ryan Palmer – A Texas native playing in Texas. I think his ownership will be high, based on the fact that it seems like no one knows what to do this week, so we may as well through a Texas native in there right? I will say that be careful on this play as the only thing he really has going for him is driving distance. Tim Wilkinson – Stay in the flames Timmy Wilks! My goodness has he been playing good golf. Not a bomber, but he is ranked first in scrambling and top-10 in strokes gained putting. 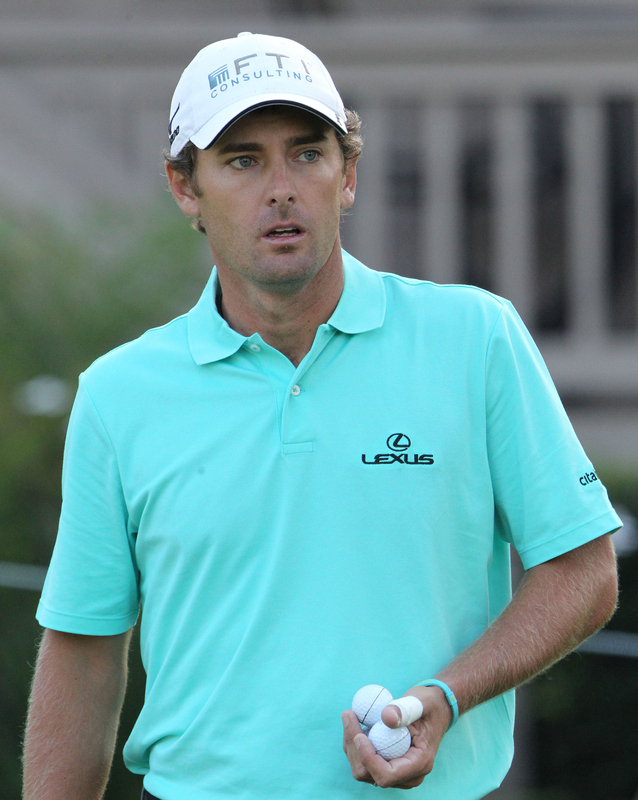 Lucas Glover – I’m projecting Glover to be the highest owned in his range. He checks out on all major stats, and has been putting some good tournaments together as of late. He also has the benefit of being surrounded by a bunch of fades. Don’t sleep on Glover, but don’t think you’re getting a steal either. Jonas Blixt – Hello sleeper! Vegas has him much higher than others in his range, and that typically means something. Definite contrarian play, and again, he has the added benefit of playing Thursday morning. Adam Hadwin – I’ll continue to tote Hadwin’s name until he burns me. He has been consistent as of late. He’s not a huge bomber off the tee, but he is a DraftKings scorer, as he tends to get his putter hot. I like Hadwin to continue his birdie barrage this week. ***As for the Thursday afternoon players, Dustin Johnson is the obvious course horse this week, and look out for players like Andrew Loupe, Sean O’Hair, Marc Leishman, and it also looks like Jordan Spieth is having fun again. OOOHHH-WEEEE! It’s The Players Championship week! Commonly considered the 5th major and the strongest field in golf, The Players needs little introduction. Jordan Spieth will finally make his return after the well-documented Master’s meltdown, as will Master’s winner Danny Willet (and his twitter-fingered brother). With such a star-studded field, the difficulty in making picks gets amped up, so let’s get to it. Will Jordan Spieth be back to his regular self in his first week back since the Masters? Like in majors, you have to assume that winner will most likely come out of the high-end range, AKA one of the elite players in the field. It is at least safer to assume so than in tournaments with overall weaker fields. Jon: The two names at the top are Rory McIlroy and Jordan Spieth at $11,700 and $11,400, respectively. I don’t think you can go wrong with Rory, however I know my esteemed colleague Tom might have different feelings on the matter. Jordan is who I really want to talk about. Sandwiched between McIlroy and Day, I am guessing that Spieth might have unprecedented low ownership, and I believe that is a mistake. The headlines for Jordan are all about whether or not the Master’s collapse will haunt him this week, or whether he’s ready to contend after the lengthy break. Let me tell you one thing about hyper-competitive people: the second people start to doubt them, they show up, and they show up big. And Jordan has the hyper-competitive card in spades. Along with Spieth, I like Justin Rose coming off of a top five finish at Quail Hollow. If he can get his putter working, admittedly a tall task for Rosey, I expect to see him get his GIR on, in order to contend. Tom: My aforementioned disagreement with Rory stems from two things: His popularity vs. his inconsistency. Do I think Rory is a bad play? No. What I do think is that he’s already being crowned the favorite and will be highly popular, yet he’s been wildly inconsistent this year. Most people are interpreting his 66 on Sunday at the Wells Fargo as Rory “finding his form at the perfect time.” But I see it as Rory not being able to put 4 rounds together this season. Before his 73-69-73-66 last week, he also put up a 75-67-75-65 at the Arnold Palmer, and a 71-65-68-74 at WGC-Cadillac (remember that forgettable Sunday round when Adam Scott won it all??). So I see a Rory fade as an opportunity to save money for more dependable guys. For example, I think Jason Day is far more worthy of a roster spot. Due to his mixed results (to put it nicely) in this tournament, no one is really talking about JDay. That provides a great opportunity to take the world number 1/hottest player in golf when his ownership % likely won’t reflect it. Jon: I will not be exposed to Rickie Fowler at all this week. It could be a good move, it could be a bad move, but I don’t like that he hasn’t been able to finish off a tournament on the tour this year, and I definitely don’t like that he blew up on Sunday at Quail Hollow. I also don’t like taking a defending champion. While I haven’t worked out the math, I’m pretty sure there is some Bayesian rule(statistics are fun!) about the probability of winning an event, given that a player has won the year before, that makes it a more unlikely scenario. Phil also makes for an interesting decision this week. Having been cut the last three years I could see playing him being a risky decision. I will most likely fade him, unless I use him as a contrarian play. Tom: I agree with Rickie being the best fade option up top, but next down on the list for me is Branden Grace. I see below that my colleague and dear friend Jon disagrees with me, and makes a strong case for Grace. I can’t argue with the support of him, and my choice to fade is purely an eye-ball test. Grace has been playing great golf, but the Players is a war of attrition, at a tough course with one of the toughest fields in golf. While Grace has benefited from easy fields with his win at the RBC Heritage and T9 at the Valero, I think his results here will more likely mirror the Master’s where he did not even scare the cut line. *Grace has made the cut in his only two Players starts – T42 in 2015 and T48 in 2013. * Finally, many people will be taking Martin Kaymer as a recent past winner at 7.2K. I’m going to use that as a perfect fade option, applying the “what have you done for me lately?” thought process. Jon: Spieth & Rory – mentioned above. Sergio Garcia – Consistent cut maker at TPC Sawgrass. 3 top-10 finishes the last three years, and as far as I’m concerned, he’s playing really well right now. It’s always a gamble to see if Sergio’s ownership will reflect the “can’t finish” stigma that follows him around, even in a tournament where he’s considered the ultimate course horse. Henrik Stenson – If there’s one thing I like, it’s a bounce back play. Vegas and Rose have both come through for me the past two weeks, and I like Stenson to make it 3-for-3. After burning a few people last week, this course sets up well for him, I like the Swede this week, hopefully with some low ownership as well — although don’t expect it. Adam Scott – Not so much because “he’s won here before” (that was way back in 2004 when Usher/Lil Jon/Ludacris’ Yeah! was topping the charts), but because of his play this year. Scott has won twice in Florida with tough fields, and on tough courses with a lot of water that will be similar to this week’s test. I think calling on him to win is a stretch, but counting on him for a top 15 with good scoring is safe. Hideki Matsuyama held off Rickie at the Waste Management, and is one of our top picks to challenge the field at the Players. Photo courtesy of the Scotland Herald. This is my “must play” of the week, and also my “if he burns me I will be forced to consider closing my DK account” play, because I am putting (nearly) all my eggs in the Hideki basket. I will hold him from 1 or 2 lineups to be safe, but I could not be higher on this guy. Based on how quiet his T11 was last week, I think people felt he burned them when he didn’t, and now he comes in priced between the two likely DFS favorites, Sergio and Henrik. So Hideki could be forgotten by many. In 2016, he is 7/9 in cuts (one being a WD), with 6 going for top 20s, 3 were top 10s, and 1 was an epic playoff win against Rickie. Last week’s Wells Fargo was his first tournament after a T7 at the Masters, and he got progressively better, shooting 74-71-70-69. On top of that, he has improved at the Players in each of his two starts, moving from a T23 in 2014 to a T17 last year. I think he is as safe as Scott for a top 15, and am personally predicting a top 5. Branden Grace – Unlike stupid Tom(! ), I like Grace a lot this week. 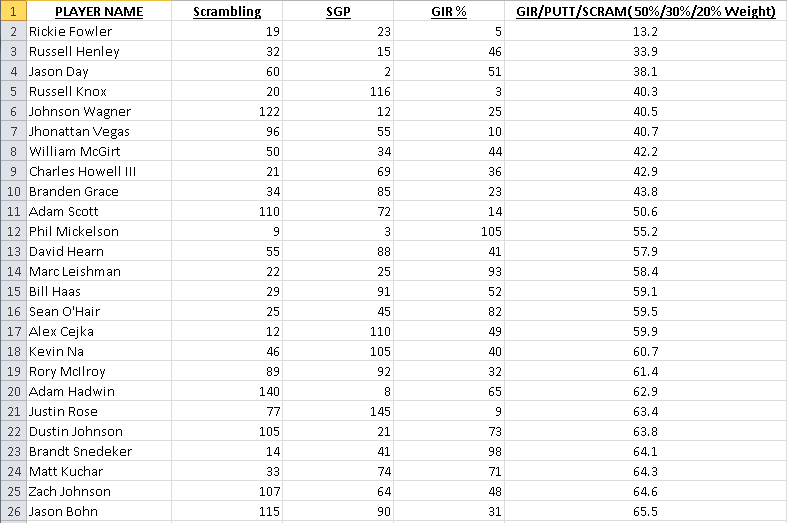 Scrambling and GIR% are right there, and his average proximity for both rough and fairway — weighted equally — is around 37 feet, which is in the top 20 of the field. Couple that with recent form, and Grace looks like a good play this week. Chris Kirk – In keeping with the theme, Kirk has great course history, and has been trending in the right direction, coming in T23, T13, and T5 in his last three events. He looks to be over his hand injury and merging form confidence with course confidence this week – always a deadly combo. Russell Knox – Does everyone know that Russel Knox is 4th in the Fedex Cup standings? Does everyone also know that Knox is a Jacksonville resident and this is his home course? The Scotsman has stats that lineup really well at Sawgrass. My only hesitation is a win on the PGA tour tends to inflate statistics higher than their true mean. With that said, he has comes in with a win in a WGC event and two 2nd place finishes this season, so maybe he is just playing that well. Rafa Cabrera-Bello – I honestly do not understand the $7,100 price tag this week. His lowest finish this year has been a T36. Although he has zero course history, I just don’t see him missing the cut this week, which makes him a huge upside pick since he’s also itching for a win. GPP play for sure. Will Leishman have what it takes to take home a victory at TPC Sawgrass? Marc Leishman – Another cut maker at TPC, Leishman has notched a 24th, 23rd and an 8th place finish in his last three starts here. 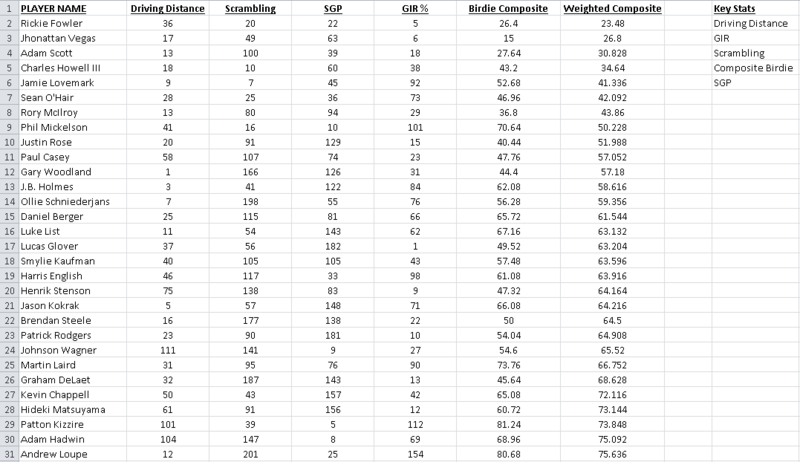 I also can’t ignore the high rankings in scrambling, GIR%, strokes gained putting, and our composite driving stat (made just for TPC). If there is one player who lines up for a win this week, for me it’s Leishman. Honorable mentions: Russell Henley could be a great GPP play, but play at your own risk as he always seems to have those patented Russell Henley blow up days. Bill Haas is not a secret in the world of golf, but at 7.5K he’s obviously not deemed a favorite. But before his missed cut last week, Haas made 5 straight including a runner up, and T14 at the Heritage, the last Dye course played on Tour. Haas has made 3 of his last 4 cuts at the Players, including a T4 last year. Ryan Moore – Call him a grinder, call him a plotter, call him whatever you want. Moore is not a long hitter, but can put the ball in position. That is what we’re looking for this week, in addition to guys coming in with form. Moore may be coming off 2 missed cuts, but he performed highly at the Matchplay (a Pete Dye course), on top of top 10s at the Valspar and Northern Trust earlier in the year. Chris Stroud – Stroud is a sneaky play. Perhaps too sneaky, which could result in being burned. But he’s one of those needle-in-a-haystack guys where the numbers seem to line up way too well for a 5.8K priced guy. He’s coming off 6 straight cuts made (none higher than a T20), and is 5/6 at the Players, including a T10 in 2010 backed up with a T12 in 2011. You could do a lot worse at that price. David Hearn – If you want a low-priced cash game play, look no further than Hearn. He hasn’t missed a cut here, and even notched a top 10 in 2014. #FeeltheHearn. Sean O’Hair – O’Hair has quietly had a pretty good season. Once again, the course management style play should bode well for him. He has course history, albeit not spectacular, but he’s earned a reputation for showing up on Dye courses. K.J. Choi – Current form aside, here’s a low-end guy who’s golf game is built around course management, which is exactly what TPC Sawgrass demands. If he can find a way to hit the greens, Choi could be a nice value play at his price. Alex Cejka – I would not use Cejka in cash game lineups. In fact, I’d be weary using him in GPP lineups, but everything is there for him to succeed. He can hit greens, and he is surprisingly high when it comes to hitting birdies or better/avoiding bogeys. Take it for what you will, but he will make it in at least a few of my lineups. Hellllooo Quail Hollow! After what seemed to be monsoon season in Louisiana at The Zurich Classic, Charlotte looks to have some perfect weather for The Wells Fargo Championship. AND – unlike the past few weeks – we actually get a look at a relatively star-studded field, as tour members are starting to get warmed up for the might-as-well-be-a-major, Players Championship. The field includes players who survived the weather like Rickie Fowler and Justin Rose, as well as a return to action for Adam Scott, Henrik Stenson, Phil Mickelson, Hideki Matsuyama, Paul Casey, J.B. Holmes (2014 champ), and of course, defending champion Rory McIlroy. Even good ‘ol Jim Furyk returns to the fold, which is great, because golf is just better when the Fury is playing. **Insider’s update (AKA visible to anyone who has a Draft Kings account)** Dustin Johnson has pulled out of the field, for undisclosed reasons, so naturally everyone is assuming cocaine bender. Will Phil go the route of Jimmy Walker and Justin Rose before him and miss the cut? I am currently battling the gambler’s fallacy right now in regard to Phil Mickelson and Rory McIlroy. The past two tournaments I have been all in with the supposed “course horse,” and it has burned me good. Jimmy Walker being cut at the RBC killed most of my lineups, and Justin Rose, also getting cut last week at the Zurich, all but wiped me out. With that said, I want so badly to fade the course horses this week: Phil and Rory. Phil in particular has had “cash game success” here with his last five finishes coming in T4, T11, 3, T26, and T9. He’s never missed a cut here, and so obviously he has to be a cash game play right? Basically what this comes down to for me, is will I be more upset not playing Phil and Rory and seeing them tear it up, or more upset playing them and watching yet another “obvious play” miss the cut. As for me, this is where the gamblers fallacy comes into play – this might seem obvious, but Rory and Phil’s play this week is independent of the course horses in past two weeks (RBC, Zurich). The only reason to not play both Phil and Rory would be because people have been burned on the past two course-horses, which is the fallacy. You should not change your bet even when you’re on a losing streak. Therefore, Phil and Rory will be in a lot of my lineups. Let’s see what lefty can do this week! Total bomber lineup, with top-to-bottom driving distance ranks of 2, 3, 5, 9, 7, and 1 respectively. Make no mistake about it, Quail Hollow is a course for bombers, with two of the past three winners coming in first in driving distance (Derek Ernst came in 11th in DD during his victory, so not far off). Bombers just get a major advantage at this course, and it’s entirely possible to make a lineup of top-10 bombers with Tony Finau, J.B. Holmes, Jason Kokrak, Jamie Lovemark, Ollie Schniederjans, and Gary Woodland. And actually I probably will enter that lineup in a GPP just for fun. Out of those six, I like Woodland and Holmes the most. Woodland lines up the best, as he looks to be in a better position to have his putter heat up, but Holmes is also playing really well right now, and has a slight edge in his scrambling ability, not to mention he won this thing only two years ago (which will probably inflate his ownership). I wish Ollie Schniederjan’s ownership percentage would be lower than what I think it will be — I’m sure fantasy guys like Pat Mayo will mention him, and talk about how he’s been tearing it up on the Web.com tour. Players will see the $6,400 price tag and think they will be getting a steal. Bold prediction: Schniederjan’s ownership will be greater than 10%. Rickie Fowler $10,900 – Eventually I have to get back on the Rickie train. His stats don’t lie. He had a nice tournament last week at the Zurich, and he did earn his first PGA win at this very tournament. With The Players a week a way, I’d look for him to make a big move here, and in fact, a bigger one than he will next week with the pressure of defending Sawgrass (note his ownership % figures to be much higher next week too). Adam Scott $10,600 – Stay in the flames. Adam has been red hot this year, and everything about this course wreaks of Scott’s play as of late. 13th in distance, 39th in strokes gained putting and 38th in GIR%. He’s had great form, and I wouldn’t be surprised if he’s actually slightly under-owned this week simply because people have forgotten about him through his lack of starts. Justin Rose $10,000 – Just like the Jhonny Vegas play last week, a Rose bounce back could be in the air. Rose already goes under-owned typically, and with him burning so many people last week, I like his ownership percentage to be way down this week. He rarely misses back-to-back cuts, which makes him a perfect, and even fairly safe play this week for GPPs and cash games. J.B. Holmes $9,100 – Mentioned above, Holmes has been playing exceptionally as of late, with 3 top 10s, 7 top 25s, and no missed cuts. With his distance off the tee, scrambling ability, and overall good juju on this course, I’d put him in both cash and GPP lineups. Charles Howell III $8,100 – “They call me…Mr. Cash” – I’m worried that by writing this, I’m just asking for a Charlie 3-sticks jinx, but the guy has been solid all year with making cuts and finishing high. 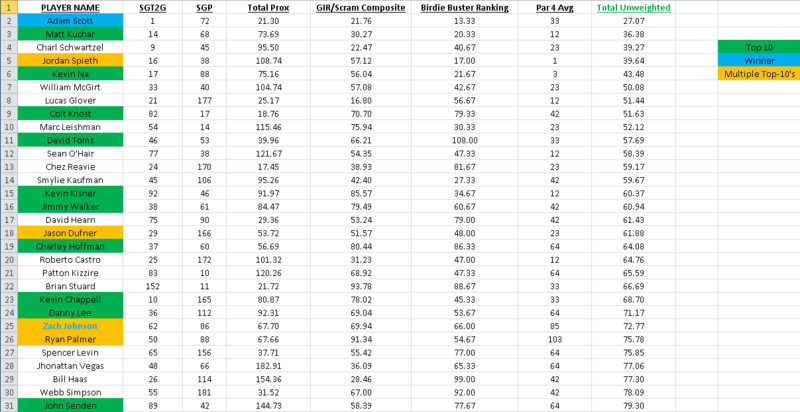 He’s top-50 in all of the key stats we studied, except strokes gained putting (ranked 60th). He just gets it done. The only thing that worries me is how much he’s been playing, but I’m going to stay on board until he proves I shouldn’t. Kevin Chappell $7,900 – When Dustin Johnson drops out, you gotta go with DJ-lite. Chappell also fits the mold regarding key stats: bombs it off the tee, and just needs to get the putter going. With Lovemark, Simpson, and Woodland all priced around Chappell, I like him to have low ownership, and high upside. Gary Woodland $7,800 – Woodland’s got two things going for him: he’s a monster off the tee, and doesn’t miss a lot of greens in regulation. He’s a cut maker having only missed 1 cut all year. He will desperately need to get his putter going in order to make a run, and if he does, then lookout. Jason Kokrak $7,200 – Kokrak may as well be Gary Woodland Vista – in that he mimics all of Gary Woodland’s stats, he just doesn’t run as smoothly. He’s big off the tee, 9 of 16 cuts made, and can make his pars. Like Woodland, the question will be if he can get the putter going. Lucas Glover $6,300 – Glover is right around the 300-yard average for driving distance, which is works for Quail Hollow, and he comes into this tournament ranked first in the field in GIR %. He has the ability to go low, and I think he has been slowly improving as the year continues. Andrew Loupe $5,700 – I’m staying on the Loupe train, even though it might be “Destination-Chernobyl.” I can’t ignore his putter, and I don’t think his past two cuts are indicative of the player that he can be. He continues to be a GPP play. 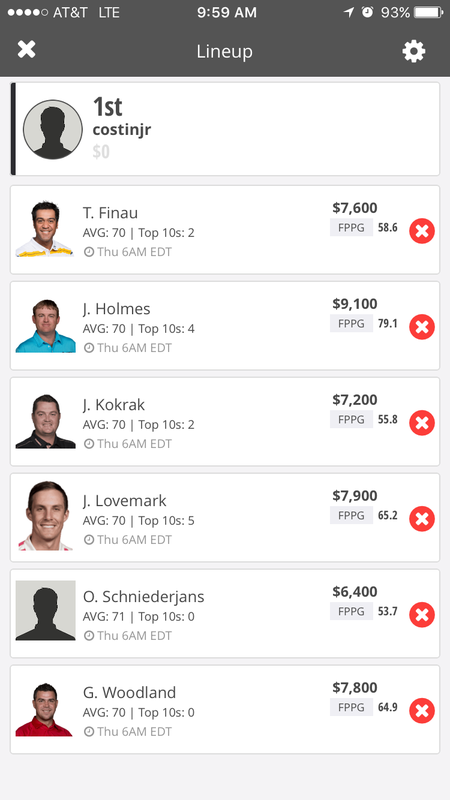 Jhonattan Vegas $6,400 – I didn’t take my own advice last week. Out of all the 6k range players, Vegas looks to be the most mispriced. He didn’t putt well in his last round of the Zurich, and it took him out of contention. Everything else was working just fine, though. I’m all in on Vegas this week.